For today's edition of the Pet Blogger Hop, we're bringing you a special announcement from Petfinder. In honor of its 15th birthday on March 15, Petfinder is asking animal lovers everywhere to spread the word and tell at least one person about pet adoption. Blog, tweet, facebook or just tell a neighbor... any way you share the news is one more way to help homeless pets. You can find out more ways to help on Petfinder and here are a few of their suggestions to get you started. Take the Petfinder pledge to tell one person about pet adoption on March 15. By pledging, you'll enter for a chance to win one of 10 Pet Hair Eraser Vacuums from Bissell. Caption a Petfinder adoptable pet photo on ICanHasCheezburger! Photos with the best captions will be featured on the ICanHasCheezburger.com homepage on March 15. More than 320,000 pets are waiting for homes on Petfinder.com. Help Petfinder Adopt the Internet today and find forever homes for as many as possible. On March 15, share an adoptable Petfinder pet on Twitter with the hashtag #adopttheinternet. For more, visit Petfinder's Adopt the Internet page. 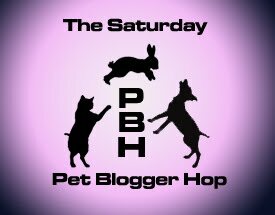 Now, let's go to the hop! Nice post about PetFinder! I just found out about their celebration and wrote about the adoption birthday of my dog, Jaffery! 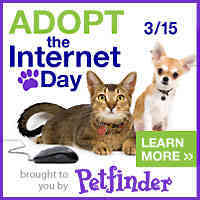 Petfinder has been around for awhile and “Adopt the Internet” supports a great cause. It is important for your Visitors to know about aKeKee.com – The Pet Search Engine.™ as well. aKeKee is the first vertical search engine for pets and offers animal lovers the convenience of a simple Google-like interface, customized search filters and the ability to sign up for email alerts to stay informed of the latest postings. aKeKee is a free resource providing animal lovers easy access to hundreds of thousands of pet postings from dogs and cats to alpacas. Simply put, aKeKee is Petfinder and more.